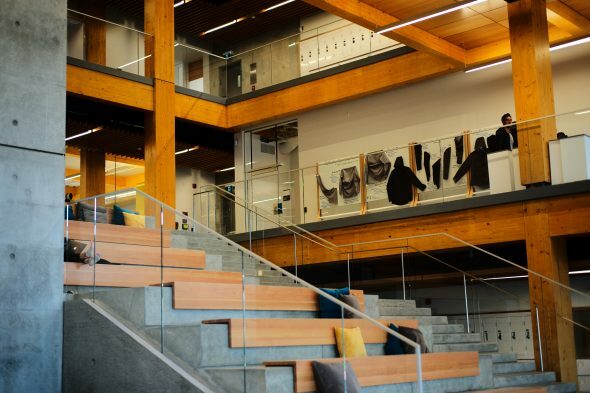 After years of planning, construction, and some delays, Kwantlen Polytechnic University’s new design school building is open to students. While some finishing touches are still being made to the Richmond campus location, many Design students are already taking classes in the new space. Carolyn Robertson, Dean of the Wilson School of Design, considers the building to be a massive upgrade for both the Design program and the university at large. While the building and classrooms are primarily for Design students, there will be opportunities for other faculties such as business, arts, or sciences to take advantage of the space. Previously, Design students took their classes in the upper floors of the Richmond campus, which was darker and more difficult to navigate than the new building. “We’ve provided much more of an environment where students can interact from all different programs,” says Robertson, gesturing towards a large space with a massive whiteboard and interactive projectors. The projectors have touch screens, and students can connect to them to collaborate with others in the area. The architecture of the space is what one might expect of a building meant for Design students. It was built with an open concept in mind, its centre a large space in the middle of the ground floor for lounging or, potentially, exhibitions. Every floor is designed to facilitate collaboration, including large white boards, couches, and plenty of wide glass windows which offer an impressive view of the mountains. Another unusual aspect of the building is its full-sized lockers, which Robertson says are for students to leave materials such as clothes, product design drafts, and posters in. One of the other impressive elements of the building is the key card system. Students will have access to various parts of the building using personal key cards. Also in the building are sinks and fridges for students to use, which may be welcome, given the relentless hours fourth-year students in the Design program are known to work. Robertson notes that students in that program don’t go to the library to get work done; instead, they use tools like laser cutters, printers, and sewing machines in the work spaces where they’re available. Before the construction of the Wilson building, Robertson says that Design students were mostly confined to the few classrooms in Richmond Main that they were required to go to, and didn’t have much chance to meet with each other or think creatively in the space around them. Now, she hopes that the new, open concept building will help inspire collaboration. At the top of the building is one of its only locked rooms, labelled “Design Research Network”, where private projects are worked on. 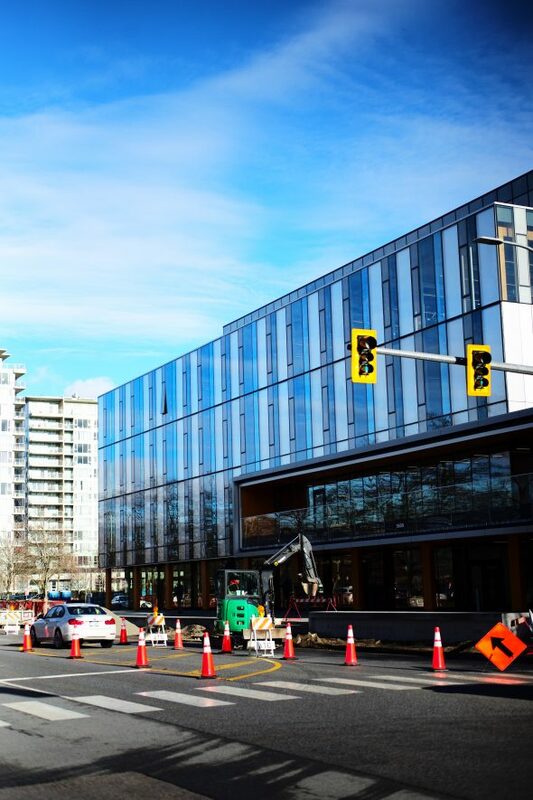 The construction of a new building such as the design school has been a compelling idea for KPU ever since 2012. Wilson and his wife Shannon contributed $8 million of the total $36 million budgeted for the building, while their company, Lululemon, donated another $4 million. KPU and the B.C. government provided the remaining funds by contributing $12 million apiece. 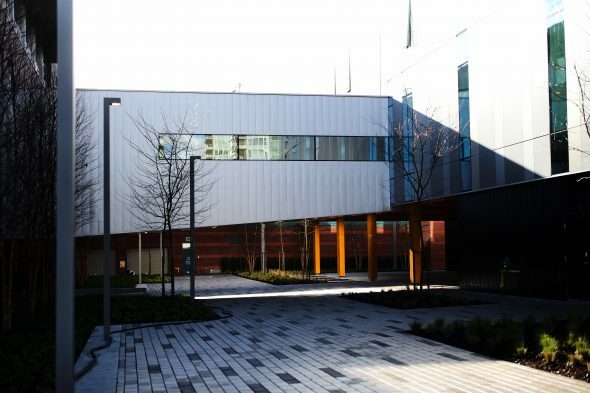 “The funding for the Wilson School of Design building is part of a larger capital investment of $1 billion towards B.C.’s public post-secondary institutions and is motivated by our government’s commitment to provide accessible and affordable post-secondary education,” wrote Mark, in her statement. While the project stayed within budget, it was beset by several delays, often concerning financial constraints and completing the building’s desired features. The Runner interviewed university president Alan Davis in July of 2016 as ground was breaking on the project. Then, Davis indicated that initial tender for the project was going over the $36 million that was allocated, but that KPU worked towards ensuring that the project would stay within budget. Despite this, Davis assures that the intended functionality and sustainability features of the school were still part of the final design. When walking into the Wilson building, to the left and through the doors of the sky bridge, is the Dean’s office. In the window of this office is a display of clothing, what appears to be a 3D printer and, perhaps unusually, a motorcycle.